Danish cellist Jonathan Swensen,aged 18, started playing cello at age 7 and has already won numerous competitions in Denmark and Sweden; the Öresunds Competition 2011, Berlingskes Classical Musiccompetition 2012, "Play For Life" competition, where, in the last round, he played the Lalo cello concerto with the Danish Radio Symphony Orchestra, and the Stockholm International Music competition. He has been studying with professor Mats Rondin at the Malmö Conservatory, and is now starting his first year at the Danish Royal Academy, with professor Toke Møldrup. Besides from the competition prizes he has received several merit scholarships in Denmark, such as "Jacob Gades Talentprize", "Valdemar van Hauens Scholarship" and "Christian P. and Hustrus Scholarship". This summer he toured with the youth symphony orchestra, "DUSIKA", playing the Dvorak cello concerto in Krakow and Warsaw, Poland, and ending the tour in the Tivoli Concert Hall in Copenhagen. This summer he also performed the Saint-Saens concerto with the Symphony Orchestra "Arco" also in the Tivoli Concert Hall. He is currently playing as a member of the clarinet trio "Trio Aulos", with two of his good friends and colleagues, the pianist Elias Holm and clarinetist Jonas Frølund. This group has played many concerts this year, and is playing a recital at the festival "Schubertiaden" alongside such groups as "Trio con Brio". 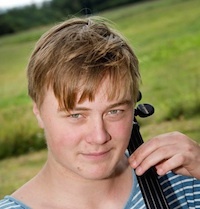 Jonathan has twice been invited to play at the “Langvad Chamber Music Jamboree” in North West Denmark by artistic director Thomas Bowes and here he has played major chamber music works by Korngold, Debussy, Brahms, Mozart and Dohnanyi. Besides the Langvad Jamboree, Arcadia is one of the first festivals in which Jonathan is participating as a professional artist and he is delighted to be collaborating with such experienced colleagues.